The regime of the military junta has split the Argentine society and brought the country close to civil war. Decades later, many Argentines are still going from pillar to post in search of their lost relatives. They call them desaparecidos, the disappeared. It is said that about 30'000 people have disappeared and lost their lives by brutal state forces. 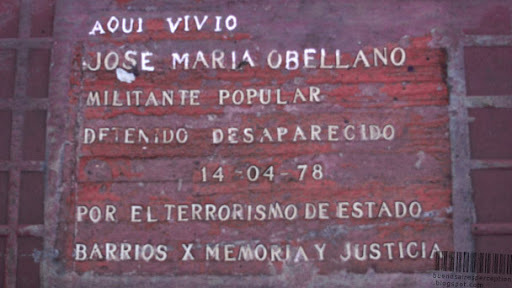 Today those commemorative stone plaques, laid into pavement by family members themselves, can be found all over Buenos Aires. They are a silent reminder for freedom and justice and they honoring the victims of the military dictatorship during 1976-1983. Nice post and honor to the disappeared. I think as citizens of our countries we all have to be wary of the unrestrained power of the state. The greatest threat to liberty is our indifference to government. I've read the stories. The stumble stones are necessary as well as appropriate. And once again, I second the comments by Clueless in Boston! I agree with Clueless. (Once again, not so clueless!) If Jose were my loved one, I would never forget. it is important to remember those who have disappeared. I went though a very good exhibition on the disappeared at the Recoleta Museum and gallery. I like going to the galleries they have with the changing artists who interpret so differently. I always learn something about history and art when i go to the Recoleta museum galleries. Thanks for posting this. It gives one cold chills, doesn't it? So important to remember. Jose Maria -- is that a woman's name? Indeed, it gives me cold chills, too! Jose Maria was a young man and just 24 years of age when he disappeared. He lived in Calle Balcarce 944 in San Telmo.